CAPE TOWN, South Africa, April 3, 2019 /PRNewswire/ -- The New Development Bank (NDB), a multilateral finance institution established by Brazil, Russia, India, China and South Africa (BRICS) in 2014, plans to almost double its loan book to USD 16 billion this year and increase its impact, as the Bank seeks to broaden its global development partnerships and mobilise more institutional and private capital. These announcements were made at the 4th Annual Meeting of the NDB in Cape Town, South Africa which brought together senior government officials from BRICS countries, leaders of multilateral and national development institutions, distinguished scholars, prominent commercial bankers, captains of industry and representatives of civil society organizations. "In 2019 the Bank will build on the strong momentum in our operations and aims to double its loan approval book to about USD 16 billion," Mr. K. V. Kamath, President of the NDB, said in his keynote speech at the 4th Annual Meeting of the institution in Cape Town, South Africa. "The Bank will ramp up its hard currency financing from the international capital markets." In 2018, the NDB approved 17 loans totaling about USD 4.6 billion, building on its base of 13 loans worth USD 3.4 billion as of the end of 2017. That brought the total loan book of the bank to 30 projects worth approximately USD 8 billion by the end of last year. The NDB also announced that on 31 March 2019 its Board of Directors had approved five additional projects with loans aggregating to approximately USD 1.2 billion, two in China and three in South Africa, taking its total loan book to USD 9.2 billion as of today. These five new projects include RMB 825 million (USD 123 million) for the Shengzhou Urban and Rural Integrated Water Supply and Sanitation Project (Phase II); USD 300 million for the Guangxi Chongzuo Urban Water System Ecological Restoration Project; USD 480 million to Eskom for the Environmental Protection Project at Medupi Thermal Power Plant; ZAR 1.15 billion (USD 80 million) to the Industrial Development Corporation (IDC) for its Renewable Energy Sector Development Project; and ZAR 3.2 billion (USD 220 million) to South Africa's Trans Caledon Tunnel Authority (TCTA) for work on the Lesotho Highlands Water Project (Phase II). During the 4th Annual Meeting of the Board of Governors of the NDB, its members provided strategic guidance for the Bank and appreciated the growth of the Bank's loan portfolio. The NDB was established to mobilize resources for infrastructure and sustainable development projects in member states as well as other emerging economies, and the Bank is strongly committed to supporting the sustainable development agenda of its member countries. "The share of the BRICS countries in world GDP in PPP terms has grown from 30% to 36% since 2010. This growth has put increased pressures on natural resources and the environment. Fortunately, however, our members have explicitly recognized these pressures and are increasingly investing in undoing some of the past damage. Our members are also focusing on implementing development strategies aimed at minimizing adverse impacts in the future. In both these endeavours, the Bank is being called upon to assist," said Mr. Kamath in his keynote speech. In keeping with the theme of sustainability at this year's Annual Meeting, the Bank announced that it had signed a USD 180 million loan agreement with Eskom to fund the integration of 670 Megawatts (MW) of renewable energy into South Africa's power grid as well as a two-step USD 300 million loan to the Development Bank of Southern Africa (DBSA) to reduce emissions of greenhouse gasses and support renewable energy in South Africa. "We plan to end the year with total loan approvals of about USD 2.3 billion in South Africa," said Mr. K.V. 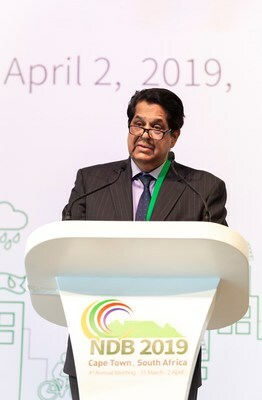 Kamath, adding that the opening of the Africa Regional Centre (ARC) in Johannesburg in 2017 had helped the NDB make progress in South Africa. In the last three years the NDB approved only three projects worth USD 680 million from South Africa. Importantly, the efforts of the ARC had enabled the Bank to identify six new potential projects for 2019, of which three, worth USD 780 million, were approved on 31 March (see project detail above). The NDB now plans to open additional regional offices in Brazil and Russia and is considering opening an Indian regional office in due course. Mr. K.V. Kamath said at a press conference at the end of the event's first day that the expansion of the Bank's membership is expected to be discussed at the 11th BRICS Summit, which will be hosted in Brazil later this year. He also provided greater detail on the Bank's plans to raise capital in local currency in the markets in which the NDB extends loans in order to reduce exchange rate risks to borrowers. "We will help deepen the capital markets and will be a quality paper issuer given the rating we have," said Mr. K.V. Kamath. The NDB has a AA+ long-term issuer credit ratings from S&P and Fitch. Mr. Leslie Maasdorp, Vice President and Chief Financial Officer of the NDB, added that the Bank had received regulatory approval for a ZAR 10 billion local currency bond programme in South Africa. "We are focusing on the development impact of our lending through more robust monitoring frameworks and measurement of projects' contributions to our members' SDG commitments," said Mr. K.V. Kamath. "Sustainability therefore remains at the core of everything we do."